Nostrum produces, distributes and sells its in-house prepared dishes that stand out for being prepared using traditional recipes, using 100% natural ingredients. Its quality is recognized by its clients resulting in a fan base of more than 800,000 members. Nostrum has partnered with CryptoFranchise in order to become the first brand in QSR creating and using its own cryptocurrency, the MealToken. Concurrently, Nostrum will collaborate on the development of the CryptoFranchise platform to strengthen the franchise business models with the help of blockchain technology. Once the platform is ready and operating, franchise businesses from all over the world will be able to enjoy the benefits of adapting to the changes in technology: hybridizing the offline and online shopping models. Nostrum will be the first brand to make use of the CryptoFranchise system. To become a member of the Fan’s Club and have access to the Smart Discount prices, the Client will have to top-up his/her wallet with MealTokens. Cryptofranchise enables the franchisee to deposit the entry fee in tokens in their wallet, and have the chance to recover the amount once the franchise/master franchise agreement has ended. Every time the franchisee achieves one of these goals, he will receive a certain number of tokens as a reward. 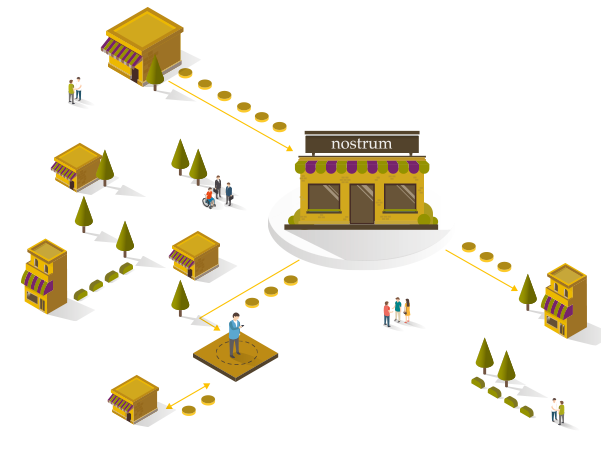 Nostrum fan’s club members will voluntarily decide to be a part of the Nostrum Delivery Service and receive in return tokens that can be used in the restaurants. A professional team that provides an array of support and education, from training events and service providers to technical support for the ecosystem. A retired professional basketball player of the Spanish national team and an investor/promoter of technology projects. A Blockchain, Crypto economics, ICO and funds specialist, with over 25 years experience in asset management business. Sr. Intl. Business, Asset Management, iGaming, Tax, and Immigration Attorney for Empire.Legal. The Mealtoken ICO takes place in a best-in-class technological security and regulatory compliant environment. The MealToken is an utility token (and by granting access to certain Nostrum services, it acts as a reward / incentive instrument) with a payment function (deprived from any claims on the issuer) within and limited to the Nostrum tokenized ecosystem. We are happy to announce that the MealToken is finally alive! Consensus 2018 in New York is well underway but far from done!